The book is not out yet - it will be soon, in March. But by now (February) the rights are already sold to Germany. To the publishing house of Gerstenberg. I'm talking about THE COUNTING BOOK OF PRINCE HAYO THE HAPPY - a big and colourful picturebook ánd a counting book, all in one. Made by the dazzling Mattias De Leeuw (pictures), the text is by me. We worked together on two books before: THIRTEEN RUNNING DEER, that was sold to Germany, China, Taiwan and South-Korea, and received a nomination for the German Literature Award 2015. We also made a poetry-picture book about happy sounds: MY HAPPY BOOK OF SOUNDS. 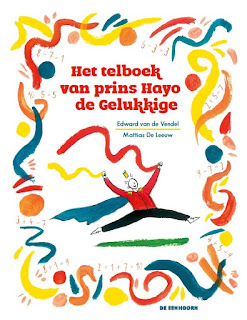 As for PRINCE HAYO: for the coming bookfair of Bologna this book is available at both the original publisher (De Eenhoorn) and the Flemish Literature Fund. You can take a look at a few pages of the book here.